Portable or permanently installed standby generators can come in handy during long-term power outages. However, if you do not know how to use them properly, they can be dangerous. Contact a qualified vendor or electrician to help you determine what generator is best suited to your needs. Before using, read and follow manufacturer’s instructions. If you are installing a permanent generator, it must have a transfer switch. The transfer switch prevents energy from leaving your generator and going back onto the utility electrical equipment, when it could be dangerous to a lineman or others near downed power lines, a process known as “back feed.” A qualified electrician should install your generator and transfer switch. Operate it outdoors in an area with plenty of ventilation. Never run a generator in a home or garage. Generators give off deadly carbon monoxide. Do not plug a generator into the wall to avoid back feed. Use heavy-duty extension cords to connect appliances to the outlets on the generator. Turn the generator on before plugging appliances to it. Once the generator is running, turn your appliances and lights on one at a time to avoid overloading the unit. Remember, generators are for temporary usage; prioritize your needs. Generators pose electrical risks, especially when operated in wet conditions. 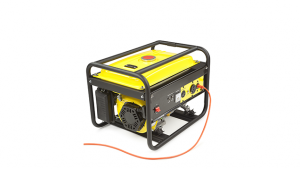 Use a generator only when necessary when the weather creates wet or moist conditions. Protect the generator by operating it under an open, canopy-like structure on a dry surface where water cannot form puddles or drain under it. Always ensure your hands are dry before touching the generator. Be sure the generator is turned off and cool before fueling it. Keep children and pets away from portable generators. Many generator components are hot enough to burn you during operation. Safe Electricity suggests these safety guidelines and basic operating instructions be posted in the home and with the generator.